The World Tourism Day was observed in Bangladesh on Thursday with much enthusiasm in line with this year's theme 'Sustainable Tourism - A Tool for Development'. Bangladesh Tourism Board (BTB), Bangladesh Parjatan Corporation (BPC), under the supervision of Civil Aviation and Tourism Ministry and Aviation and Tourism Journalists' Forum of Bangladesh (ATJFB) arranged a series of programs as part of observing the day. Aviation and Tourism Journalists' Forum of Bangladesh (ATJFB), a platform of journalists covering aviation and tourism affairs, with the support from Bangladesh Tourism Board (BTB) organized a live musical show and tourism festival titled 'Tourism Fest 2017' held at Rabindra Sarobar in the city. Popular music bands including Joler Gaan performed at the programme. The celebration of the day began in the morning with a colorful rally where tourism related government departments and different stakeholders of the country's including Tour Operators Association of Bangladesh (TOAB), Association of Travel Agencies of Bangladesh (ATAB), ATJFB and tourism related foundations and cultural organizations joined the rally. The rally started from city's Matsya Bhaban area and ended at Teacher-Student Center premises of Dhaka University. Civil Aviation and Tourism Minister Rashed Khan Menon and tourism secretary SM Golam Farooque attended the rally at TSC center. Dhaka University Tourism and Hospitality Management Department also observed World Tourism Day at DU Campus. On the occasion, varsity authorities organized rallies, seminar and cultural programs. Civil Aviation and Tourism Minister Rashed Khan Menon was present at the seminar while DU VC Prof Dr. Md. Akhtaruzzaman was present as special guest with the head of Tourism and Hospitality Management Department Professor Shaker Ahmed in the chair. Addressing programme, Rashed Khan Menon termed tourism as a tool for sustainable development. "Tourism industry will be developed using the natural beauty of Bangladesh. In order to tap the untapped potential of tourism industry, trained and skilled manpower is needed", he said. The minister also said that militancy, worldwide phenomena, is the biggest bar in the development of the tourism industry. Therefore, everyone has to work united way to eradicate militancy. Vice Chancellor of Dhaka University said, discipline, non-communalism, display of kindness and generosity towards others are the prerequisite for sustainable tourism. Therefore, tourism industry people and young generation must remain cautious in this regard. 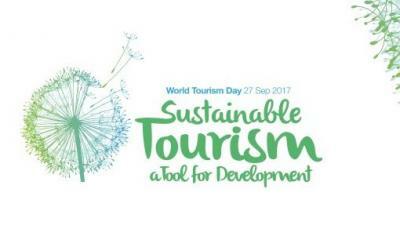 Since 1980, the United Nations World Tourism Organization (UNTWO) has been celebrating World Tourism Day on September 27.